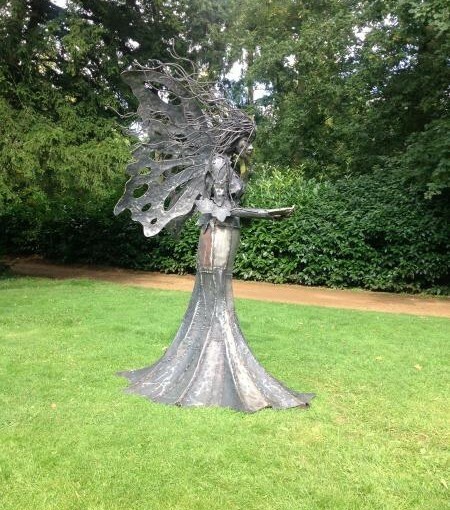 Local sculptor, Graham Thrussell has revealed one of his latest pieces of work, The Freedom Faery. Haskett are delighted to share these pictures with you, having had the pleasure of installing previous works of art by Graham into Client’s gardens. By Graham Thrussell Artist Blacksmith. This Sculpture represents ones desire to be free. Although she may be bound to stay rooted and held back by the ivy that entwines her she has found a way to free her spirit. Her dress represents the great oak of the forest their roots running deep into Mother Earth but their branches like her arms are free to reach out and touch life. Touch her hands and free your self from what ever may be holding you back from flying high. A hand forged steel frame wrapped in hammered steel each piece welded to form the figure you see before you.